MEGAMAN® smart lighting solution allows users enjoy a new level of home automation in terms of convenience, energy saving and security. Always getting smarter and adding new features, the brand new INGENIUM® ZB Smart Lighting Solution now works with Amazon Alexa voice commands. It enables you simply tell your lights to turn on/off, dim and activate the scenes without using the mobile app. You can use the mobile device or even easier - Alexa to control all smart devices of your connected home or commercial spaces. 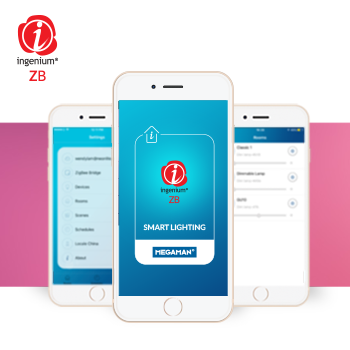 The INGENIUM® ZB Smart Lighting Solution enables automated control and scene-setting of smart devices via mobile device, making different settings to be programmed according to the time schedule of a day. Control commands are transmitted via ZigBee® equipped gateway to the Internet and the INGENIUM® ZB Smart Lighting Solution allows for the connection of 150 devices. The INGENIUM® ZB is the ultimate smart control solution for stylish living at home, offices, retail stores, and other scalable spaces. Its ease of use, simple installation and scalability makes it perfect for an endless list of smart applications.